Exodus 12:5-6 Your lamb shall be an unblemished male a year old; you may take it from the sheep or from the goats. You shall keep it until the fourteenth day of the same month, then the whole assembly of the congregation of Israel is to kill it at twilight. The point is made clearly. The Passover lamb is to be sacrificed on Nisan 14 at twilight. Leviticus 23:5 In the first month, on the fourteenth day of the month at twilight is the LORD’S Passover. Numbers 9:3 On the fourteenth day of this month, at twilight, you shall observe it at its appointed time; you shall observe it according to all its statutes and according to all its ordinances. Numbers 9:5 They observed the Passover in the first month, on the fourteenth day of the month, at twilight, in the wilderness of Sinai; according to all that the LORD had commanded Moses, so the sons of Israel did. Numbers 9:11 In the second month on the fourteenth day at twilight, they shall observe it; they shall eat it with unleavened bread and bitter herbs. The Hebrew word for twilight is `ereb. Per Strong’s Concordance, it means: evening, night, sunset. This is the same word on day one, in the beginning…Genesis 1:5 God called the light day, and the darkness He called night. And there was evening and there was morning, one day. So the question is… “When is it officially twilight?” There is much debate about the meaning of this. …to kill it at twilight. The phrase literally stated, to kill between the two evenings. The issue: when does one sacrifice the Passover lamb? Scholars have often interpreted this phrase as idiomatic language to mean a period of time before darkness. Darkness was ending after 3:00 p.m. Matthew 27:45 Now from the sixth hour darkness fell upon all the land until the ninth hour. Jesus died at or briefly after 3:00 p.m. Mark 15:34, 37 At the ninth hour Jesus cried out with a loud voice, “ELOI, ELOI, LAMA SABACHTHANI?” which is translated, “MY GOD, MY GOD, WHY HAVE YOU FORSAKEN ME?” And Jesus uttered a loud cry, and breathed His last. 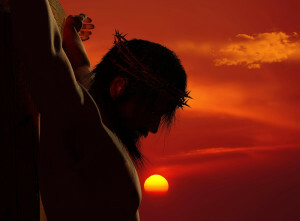 Time allowed to take Him off the cross, prepare His body, and bury Him in the tomb before sun down. Sunset in Jerusalem on Nisan 14 was 6:00 p.m. local time (no day light saving time or “springing forward” back in the day). Subtract one hour from time charts to account for day light saving time. Jesus had to be buried before sun down. The setting of the sun marked the beginning of the next day according to God (Genesis 1, Creation Week). He had to be buried before the beginning of the Sabbath in accordance with the Law. The reality is Jesus literally died between the two evenings on Nisan 14, 33 AD. That afternoon had two evenings. It was dark from noon to 3 p.m. Mark 15:33 When the sixth hour came, darkness fell over the whole land until the ninth hour. He died at the twilight of the first period of darkness. The sun reappeared. Then the sun set at 6:00 p.m. local time. Approximately 1,500 years after Moses was given the Law, Jesus’ sacrificial death fulfilled the requirements of the Passover lamb figuratively and literally, to the hour and to the minute. Topics: cross, Easter, Genesis 1, Gospel, Jesus Christ, Leviticus 23, Mark 15, Matthew 27, Nisan 14, Numbers 9, Passover, prophecy, Spring Feasts, tags 33 AD, twilight.